TV Mode: Hook up the console to the TV and everyone can enjoy playing, from kids to adults. It’s a great way to get into the game with family and friends at home. Tabletop Mode: If you don’t have access to a TV, prop up the stand attached to the console and hand a Joy-Con to a friend to play co-operative or competitive games right on the console screen. Handheld Mode: Enjoy the same gameplay experience as on a TV screen, right at your fingertips. Play engaging games you’ve never thought you can play on the go anytime, anywhere. Start a gaming party anytime with multiplayer games for Nintendo Switch. Use additional Joy‑Con controllers, Nintendo Switch Pro Controllers, or a combo of the two. - Compete against friends (or team up) at home. 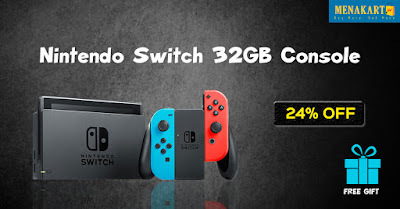 - Play online with other Nintendo Switch gamers. - Link up to eight systems together to play anywhere.